CHICAGO (WLS) -- ABC 7's Emmy Award-winning "The Ñ Beat" aired Sept. 24, 2017. 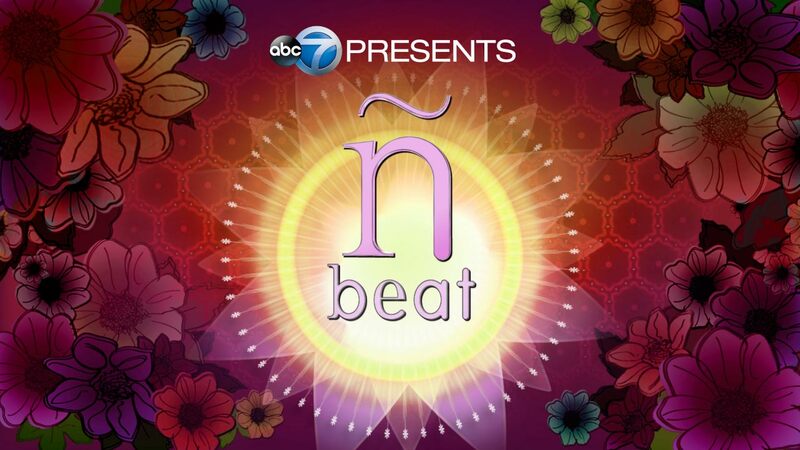 The Ñ Beat is an Emmy award-winning half-hour show that turns the spotlight on Chicago's vibrant Latino community! In this episode, meet a "Hamilton" star who is waging an important fight on behalf of his young daughter then, hear the harrowing tale of a teenager who battled back from a stroke, to help save lives. Also, check out a program helping to inspire young Chicago artists and visit a new restaurant serving up exotic tastes from 'South of the Border' in Logan Square! Miguel Cervantes, star of "Hamilton" in Chicago, is using his platform to support Chicago-based Citizens United for Research in Epilepsy. He is the star of the hottest show in Chicago -- "Hamilton." Now, Miguel Cervantes is using the high-profile platform he's been given, to benefit a cause very near and dear to his heart. His toddler daughter, Adelaide, suffers a rare childhood form of epilepsy called Infantile Spasms. As a result, she has suffered dozens of seizures each day. Miguel and his wife Kelly, have become tireless supporters of Chicago's own Citizens United for Research in Epilepsy(CURE). Their support has ranged from auctions for Hamilton experiences... to golf outings... to a song written just for Adelaide. All the proceeds from iTunes downloads of 'Til the Calm Comes' benefits CURE. Many of Cervantes' fellow cast members have rallied around him to both perform on the track for 'Til the Calm Comes' and make a special appearance at CURE's annual gala. Rachel Castro is fighting back after she sufferred a massive stroke at age 17.
she is a neuroscience major at UIC, with aspirations of someday going to medical school. Chef Diana Davila's Mi Tocaya in the Logan Square neighborhood boasts foods from various parts of Mexico and Spain. In business for less than a year, Mi Tocaya is one of the city's newest neighborhood restaurants located in Logan Square. This destination owned by Chef Diana Davila boasts an impressive selection of foods from all regions of Mexico. Prior to opening Mi Tocaya, this natural born leader traveled to various parts of Mexico and Spain studying their cuisine and even worked at Chicago's Everest and with the Boka Group. A native of Chicago, Diana was introduced to the hospitality industry at an early age because her parents owned a restaurant. Now things have come full circle for her. She is now introducing foodies to a unique spin on the food she ate growing up and to some of her grandma's favorite things to cook. Yollocalli Arts Reach provides free arts and youth programs. This is a BIG year for Yollocalli Arts Reach... this free arts and youth development initiative of the National Museum of Mexican Art is marking its 20th year! Anyone from 13-24-years old can take free classes in Public & Street Art, Digital Video & Photo and Radio-Journalism. This summer, they completed 4 outdoor murals in the Little Village & Pilsen neighborhoods. There's a state of the art radio station where students broadcast live every week. For more information about these and other programs offered. The Back of the Yards Coffee Co. serves up good coffee and gives back to community. 'Back of the Yards' had long been known as an industrial hub... with Steel plants and Stockyards but today, this South Side Chicago neighborhood is sadly known for its challenges with violence. Now, two young entrepreneurs are on a mission to show everyone how great Back of the Yards can be.. and they're doing it with artisan coffee! Back of the Yards Coffee Company opened in the shadows of Back of the Yards College Prep. This neighborhood's -first- gourmet coffee shop and roastery is a passion project for longtime Back of the Yards residents Mayra Hernandez and Jesse Iniquez. They were finally able to open this summer.. thanks to lots of hard work and a community crowd funding campaign. To 'give back' to the community they love, Hernandez and Iniguez created a 'Social Impact Fund'.. so, for every bag of fresh coffee they sell, they donate $1 to a neighborhood charity. I.C. Stars helps youth seeking to get jobs in the tech industry. I.C. Stars is a non profit organization that gives young adults across the city access to potentials jobs and careers in the tech industry. Founded by former educator Sandee Kastrul, this organization pays interns interested in problem solving and creating digital work efficiencies for fortune 500 companies. In just four months, participants are able to compete for jobs in the information and technology industry and increase their income and earnings potential.